Sizeable crispy shrimp piled with red cabbage, pickled Fresno peppers, and diced chives swim in creamy guacamole and a chipotle lime drizzle on a corn tortilla. Brussels sprouts on a taco? One bite of this Frida favorite and you’ll understand. Halved sautéed sprouts come to life dressed in a crunchy, thick smoked peanut salsa, sprinkled with cilantro and wrapped in a corn tortilla. Epic tacos are Agave & Rye’s bread and butter. The Big Thumper covers crispy onions and shoestring fries with meaty strips of coffee-peppercorn kangaroo, a fried egg, and melted aged white cheddar, all held together by a crunchy corn shell and soft flour tortilla. You can’t tell the Mantis is meat-free thanks to pulled jackfruit’s texture. 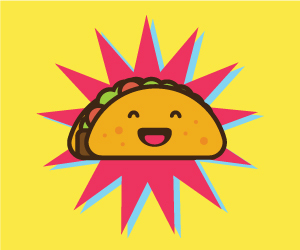 Doused in habanero-mango BBQ, the tangy taco is stuffed with cilantro, onions, diced tomatoes, and Chihuahua cheese. Its sweet Lucy shell—a soft flour tortilla lined with queso, guac, and a hard corn shell—gives it a harmonious crunch. Create your own masterpiece at Habanero. Choose the shredded grilled chicken and top it with pinto beans, Mexican rice, Monterey Jack cheese, and a sweet pineapple-chipotle salsa. Bonus: On Tuesdays all tacos are just $2. The Señor Mu Shu adds Asian flair to a traditional Mexican dish. Tender shredded pork pieces braised in ginger and Modelo beer are coated in a sweet ancho hoisin sauce and garnished with sesame seeds, lime cabbage, and avocado on a flour tortilla. You won’t want to eat cauliflower prepared any other way after eating this taco. Lightly fried in rice flour tempura and glazed with chimichurri, the white veggie takes a brown, crunchy, savory form, piled on a corn or flour tortilla and topped with crispy onions and cilantro. La Mexicana keeps it simple and authentic, with deliciously seasoned fillers like lengua (beef tongue), tripa (beef tripe), and huitlacoche (corn truffle). All tacos come complete with chopped onions, fresh cilantro, and a corn tortilla. Inebriated or not, Drunken Tacos’s chorizo taco explodes with flavor. Sweet pineapple chunks and mango salsa complement the spicy chorizo, which comes layered with pico de gallo, spinach, and crumbled queso fresco on your choice of corn or flour tortilla. Mazunte does steak tacos right. A corn tortilla bears a generous heap of tender steak chunks smothered in pico de gallo, pickled red onion, and mild salsa, topped with cilantro and soft goat cheese.